Aircoolers.ae Outdoor coolers include thick evaporative pads, Anti-UV plastic and powerful blower, heavy duty housing, and has a multi-speed configuration. Air flow is the main difference between the different models. Many customers also found that these outdoor coolers are soundless and can operate well because it can cool down a specific outdoor area efficiently. It is very easy to use too. Some customers even use it as patio cooler. Portable outdoor cooler is unique to use in dry and hot climate because it is functioning well as an air cooler and humidifier. It is also lightweight and has a remote control to change settings, so I think this portable outdoor air cooler is easy to use and is very convenient. This portable outdoor air cooler is very convenient to use because it is small and no set up is needed. It is also high energy efficient as it can quickly cool and give fresh air to a maximum of 250 square feet but only cost you 5 AED a day in daily consumption. There is also an energy saving and helps lower your costs and protect the environment at the same time. All coolers have refillable water tanks that are strategically positioned for effortless access. Evaporative coolers may be used successfully if you keep in arid locations, like the Southwestern United States. Portable evaporative coolers arrive in a variety of sizes to fit many different spaces. On occasion, it is also regarded as a `Swamp Cooler’. Nowadays, these coolers arrive with all the required installation hardware. The evaporative cooler includes a freezer pack. In the conditions of noise too, a cooler produces not as much noise in comparison to a common AC unit. If you’re wondering why you need to opt for an evaporative cooler on a conventional air conditioner, there’s yet another reason we haven’t covered yet. 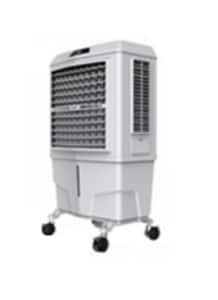 An evaporative air cooler works on various mechanisms in comparison with air conditioners. It is possible to hold this fan or utilize it like a desk fan. A fan draws air from away from the unit during the moistened pad. A highly effective fan pushes the cool air from the front part of the unit in the surrounding area. Not everybody is prepared to think that global warming is truly happening. Thus, the kind of climate you experience is the important factor in determining whether you should go for an evaporative outdoor cooler. Read the info on the way that it will work in your climate prior to purchasing and calculate the CFM you require, then study your budget. Temperature changes also impact the biological purpose of the cells in addition to biochemical reactions occurring within the body. Sometimes, the issue with air conditioning systems aren’t going to involve any of the components. The procedure for evaporation desires some quantity of energy to occur. To lessen the chance of mold and bacteria, it is critical to start the procedure for dehydration with a tall air temperature. It isn’t a decision of cost of selecting the outdoor air coolers. While room air-conditioning offers maximum flexibility, when cooling many rooms it’s generally pricier than floor standing ac. By comparison, air conditioners are generally much louder when operating. They require a decent investment, comparatively. A lot of the air conditioners have a window venting technology that can be further modified according to your needs. For instance, if you want to buy a new air conditioner, don’t choose the middle of summer to achieve that. Portable air conditioners be convenient at such places. A portable vehicle air conditioner is quite convenient to use as it doesn’t vibrate or generate any noise, which isn’t so in the event of window models.